In Round 21 of 1996, 48,884 people attended the Melbourne Cricket Ground on the 25 August 1996 to witness Fitzroy's last match in Melbourne as part of the AFL competition. Unfortunately the Lions' swansong in front of their home-town fans didn't go to plan, with the Club suffering a 151-point defeat at the hands of Richmond. It proved the second greatest losee in the Club's 100-year VFL/AFL history. Fitzroy played it's final game ever the following week against Fremantle at Subiaco Oval, with hundreds of the Lions' faithful made the trip across the nullabor to farwell the 'Club they held so dear'. Those that were unable to make the trip watched from home as the Lions fell to the Dockers by 86 points. It proved an incredibly emotional occasion for everyone involved with the Club, as Sara Macliver from the West Australian Opera sang 'Auld Lang Syne' as a final tribute to Fitzroy as they left the ground. The club played its final game ever the following week against Fremantle at Subiaco Oval, losing by 86 points. Sara Macliver from the West Australian Opera sang Auld Lang Syne as a final tribute to the Lions as they left the ground. Fremantle: Waterhouse 4, Hunter 4, Mann 3, Callaghan 2, Toia 2, Chisolm 2, Jones, Clement, White, Burton, Gale, Wills, Mitchell. 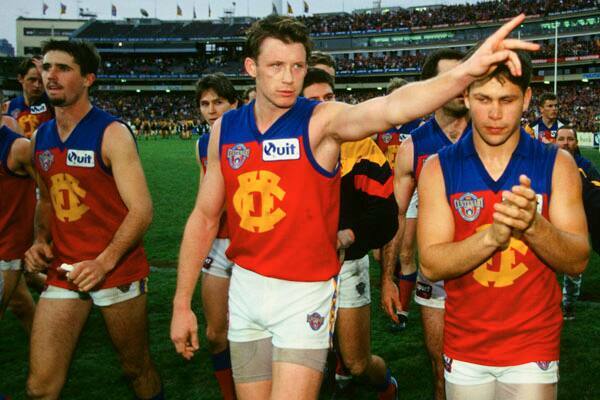 Fitzroy: Warry 4, McCarthy 2, Pike, Primus, Hawking, Atkins.